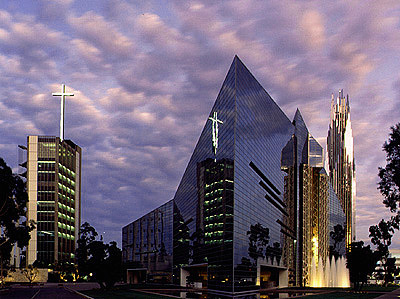 Orange County’s Crystal Cathedral doesn’t want no stinkin’ homosexuals singing in its choir. So much so in fact that the church has members sign a contract, the “Crystal Cathedral Worship Choir and Worship Team Covenant,” which requires choir members to follow the Bible in every way just the selectively homophobic ways the church decides are worth following. The church claims the contract is not to be used to ban gays from singing in the church choir, but to…um…just let them know that they aren’t welcome. Ann Moore Waltz, a longtime church member and former choir member, said she does not agree with the statement in the covenant. Don Neuen, the cathedral’s longtime choir director, left the church last year because he disagreed with Gretchen Schuller Penner’s view that choir members should be “vetted” to make sure they are good Christians, the Register reported. Penner is a producer for the cathedral’s “Hour of Power” program, broadcast to audiences worldwide. Larry LaBonte, a church member for more than three decades, said he disagreed with the clause in the covenant with regard to homosexuality as well. It’s worth noting that Crystal Cathedral filed for Chapter 11 bankruptcy last October, and owes more than $43 Million in debts. Now we’re not suggesting that God doesn’t approve of how this church is running its business. Except that, oh snap, we just did.